Key for Schools Result. Student's Book. Workbook. Oxford University Press, 2013. — 120 pages. 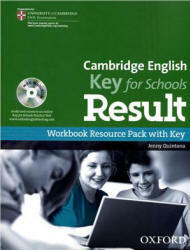 KEY for Schools prepares students for University of Cambridge ESOL Examinations' KEY for Schools exam. It provides essential exam practice, tips and strategies combined with fun, communicative activities, ensuring lessons are varied and engaging - and that students are ready for the exam. With its contemporary design and up-to-date material, Key for Schools Result is the complete preparation pack for the exam. 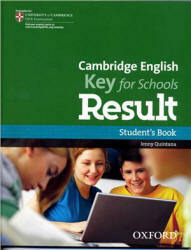 Cambridge English: Key (KET) for Schools corresponds со Level One in the Cambridge ESOL five-level system. It also corresponds to CEFR level two (A2). There are three papers in the examination: Reading and Writing, Listening, and Speaking. There is no minimum pass mark for individual papers. The Reading and Writing Paper carries 50% of the total marks, and Listening and Speaking each carry 25% of the total marks. Candidates need to score 70 to achieve a passing grade. The format and level of the exam is identical to Cambridge English: Key (KET). The Reading and Writing Paper has nine parts and 56 questions. The Reading texts are authentic and adapted-authentic realworld notices, newspaper and magazine articles, and simplified encyclopaedia entries. The guided Writing tasks include a short message, note or postcard of 25-35 words. The Listening paper has five parts and 25 questions. All parts are heard twice. The instructions are given on the question paper and are also heard. The recordings include a variety of voices, styles of delivery and accents. The Speaking Paper has two parts. There are two candidates and two examiners. One examiner (the interlocutor) will ask the candidates questions and the other (the assessor) just listens. If there is an uneven number of candidates, three candidates may sit the test together and the test will take slightly longer.